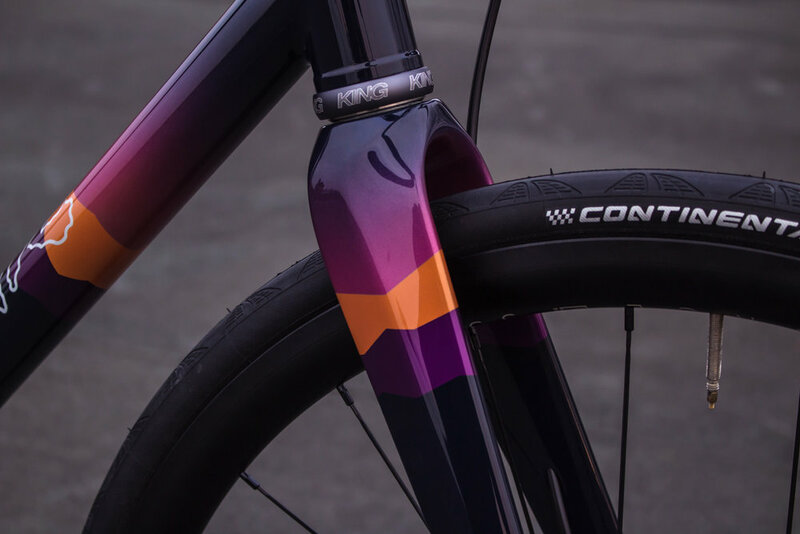 Peter's Alpenglow All-Road — Quirk Cycles | Custom Steel Bicycles Handmade in London by Framebuilder Rob Quirk. Peter came to us through his friend Mac who ordered this beautiful build from us a few years back. There’s no better endorsement so we set to work right away. 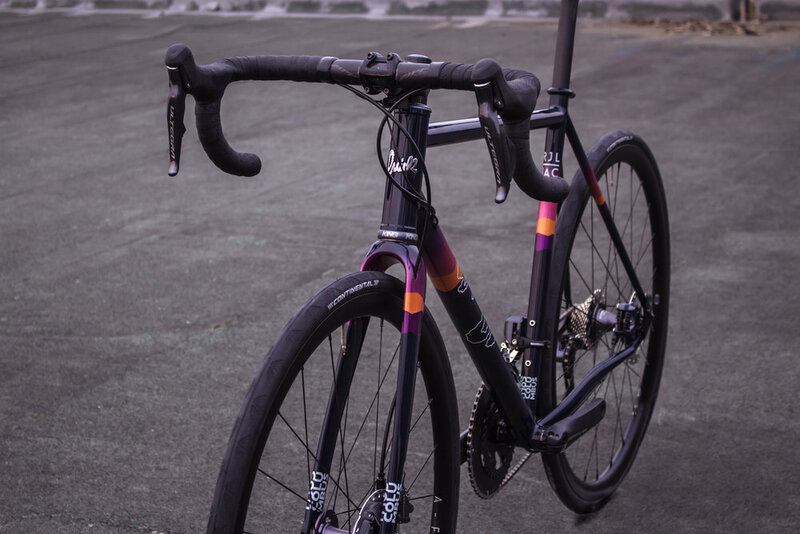 Peter was keen to a more simple build utilising the classic lines and profiles of Columbus HSS tubing and putting it to work with our tried and tested Endurance Race geometry, ensuring the excellent ride quality we’ve become known for. We could then focus on making this build ride sublimely with a roster of high end components. Without doubt the latest Ultegra Di2 is up there as one of the best group sets on the market. All the quality of shift you expect from Shimano along with a super customisable interface to run your shifting in anyway you want. All it needs now is to be wireless! The group for Peter was a no-brainer but when it came to the wheels he wasn’t sure where to go. He knew Chris Kings have the reputation and he wanted a rim that was both lightweight, aerodynamic and tough. 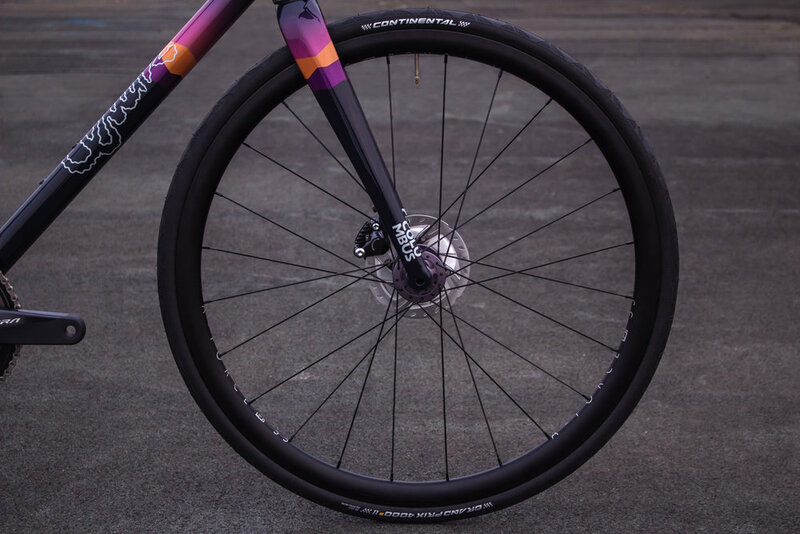 The answer was clear, no other wheel can offer the same toughness as the Force Al rim along with class leading aerodynamics and there’s no better way to do this than handbuilt by DCR Wheels. The eagle eyed will also spot the colour-matched Chris King headset for ultimate bling. To top it all off we selected the best Zipp has to offer with their Speed components - super lightweight and stiff carbon cockpit with the excellent Speed seatpost for some cush on the tush. Now where this build really shines is the mind-blowing finish executed by those paint wizards at Cole Coatings Workshop. Straight from the start Peter floated the idea of an Alpenglow design which is an optical effect one experiences in the mountains just before sunrise or just after sunset. Light refracts in the atmosphere and make the mountains glow a range of hues. With this as our inspiration we got to work designing and the result speaks for itself. This is one of our favourite builds to date and found it hard to hand over in the end!